It's been a whirlwind of a week both in the news and here Behind Enemy Lines - but don't worry, we got you covered! 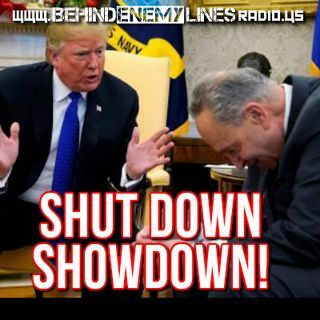 First, Gene discussed the "Showdown at the White House Corral" between President Trump, Nancy Pelosi and Chuck Schumer as they publicly jousted over the impending shut down of the government. Who landed the most blows? Who landed the best blows? Is this what 2019 is going to look and sound like? We break it down. Then, as we continue to match toward ... See More crowining the 2019 Buffoon of the Year, we welcome Gavin Clarkson to the show to tell us his hilarious run-in with paper pushers in Washington D.C. who initially refused to grant him and his fiance a marriage license.... because they didn't know New Mexico was a state! We swear, this is real - we couldn't make this up even if we tried! Finally, we'll wrap up the week that was with Gene's take on where he thinks the Mueller investigation will ultimately lead after the conviction and sentencing of Michael Cohen, and we'll highlight the story of friend of the show, Jack Buckby, who is suing the U.S. Department of Homeland Security for holding up his visa application for over two years, preventing him from visiting his fiance. And speaking of relationships... oh, we won't spoil it - tune in to find out!